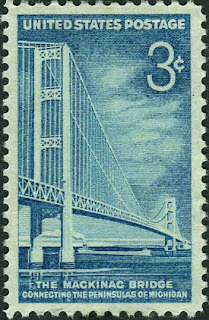 For bridges on stamps, I chose these two partly because I like suspension bridges, but mostly because I have travelled across both. The first, the Mackinac Bridge 3¢ stamp from 1958 shows off the newly built "Mighty Mac" that runs five miles, connecting the Upper and Lower Peninsulas of Michigan across Lakes Huron and Michigan. Before the bridge was built, travellers had to either drive all the way around Lake Michigan through Wisconson, or take a ferry. Either way, it was an hours long excursion. The time that we drove across, a friend was at the wheel who, it turns out, was more nervous than I about long, high bridges. It was a Sunday. On the radio was playing hymns. "Nearer My God to Thee" escorted us to the other side. Neither of us was able to move to change the station. Apparently, (I now have discovered) the bridge authority will provide a chauffeur, at no extra cost, to accompany any timid drivers. You can get more facts and stats here, but trust me, it's a long bridge. By the time I crossed this bridge connecting New York's Staten Island to Brooklyn, I'd been seriously working on my fear of long, high bridges. I was actually excited to cross it. (But, again, I wasn't actually driving) It has a suspended span of 4/5th of a mile (or 4,260') and was built in 1964, the same year this stamp was issued. The bridge was named for Giovanni da Verrazzano, a 16th C explorer who was the first European to enter New York Harbor and the Hudson River. This was a controversial choice, but with much lobbying the Italian Historical Society finally won, though for many years people simply called it the 'Narrows Bridge', or the 'Brooklyn-Staten Island Bridge'. According to one source, the name was first rejected because Robert Moses, the city planner and "master builder of NYC", thought the name was too long and besides which he'd never heard of him! Maybe that's why it is spelled wrong, with fewer letters? Apart from the fact that all ships must pass under this bridge to get to the Harbor (necessitating cruise ships to be designed to fit), it is also the starting point of the New York City Marathon. I have the Mackinac Bridge from 2010 but had not seen this one before. I don't have the newer stamp, but I've seen it and think I prefer this one. Maybe I'm just into this style of engraved stamps. I would like to have them both to put together, though. 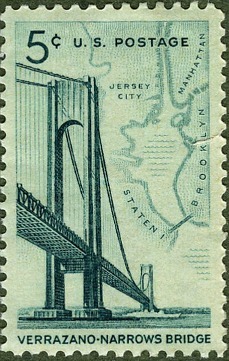 I love the fact that you have a vintage stamp showing the V-N bridge. I also like the vertical stamps - and interesting choice to show a long structure, and very effective. Bonus is the little map showing its location. I also liked that both of these were vertical. I agree, the shape of the stamp / vertical gives a beautiful perspective. Nice stamps! At that length you must have heard quite a selection of hymns on the way over the Mackinak bridge.